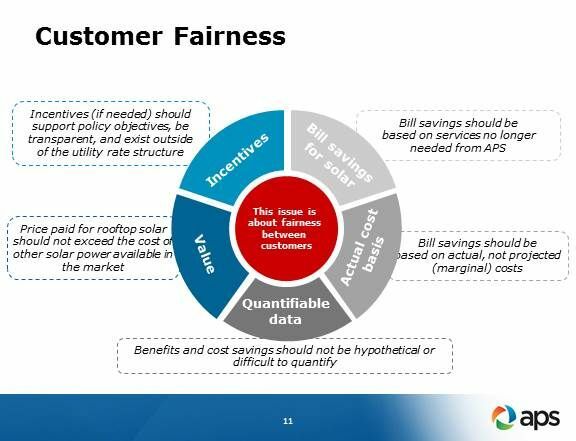 APS calls it customer fairness; solar advocates call it a backdoor tax. In the fight for net metering in Arizona, which many in the solar industry believe to be the most important fight for solar in the U.S., the state’s biggest utility wants a revision that could significantly change the cost of solar. 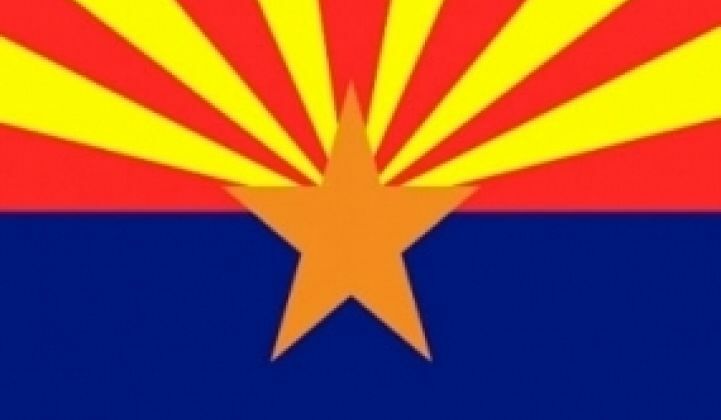 Arizona Public Service (APS) filed a proposal with the Arizona Corporation Commission (ACC), the state regulators, to offer future residential solar customers two options, either of which would reduce returns for the electricity their systems produce. “The plan is built around two options, either of which would ensure that APS customers who choose rooftop solar in the future will be compensated fairly for the electricity they generate and pay a fair price for their use of the electricity grid,” according to the APS statement about the filing. Net metering supports the growth of solar by requiring regulated utilities like APS to reimburse home and business owners at retail rates for the electricity they send to the grid. In a conference call with stakeholders ahead of the filing, APS' Chuck Miessner said the current average net metering return is between $0.15 and $0.16 per kilowatt-hour and saves the average net metered customer approximately 70 percent of their bill. The first option would lower the customer’s return to between $0.06 and $0.10 per kilowatt-hour, Miessner said. The second option would likely reduce a solar system owner’s savings by about 50 percent to approximately 30 percent to 40 percent of the monthly bill, on average. 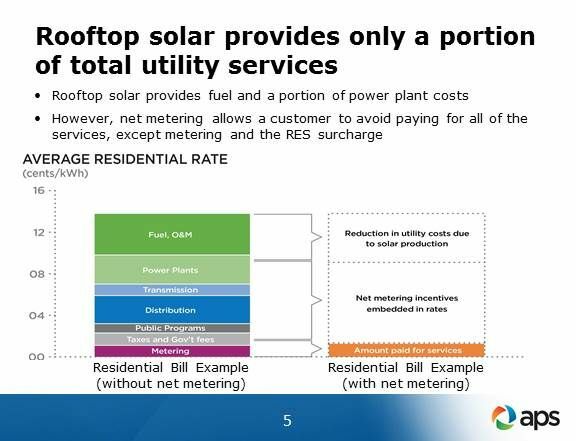 Current solar owners and those who contract for a system by October 15 and interconnect within 180 days after that would be grandfathered into the existing net metering plan for twenty years. The 44 net metering policies across the U.S. are becoming controversial because when solar owners’ utility bills roll back to zero, they escape most of the infrastructure surcharges that are part of other electricity users’ bills. 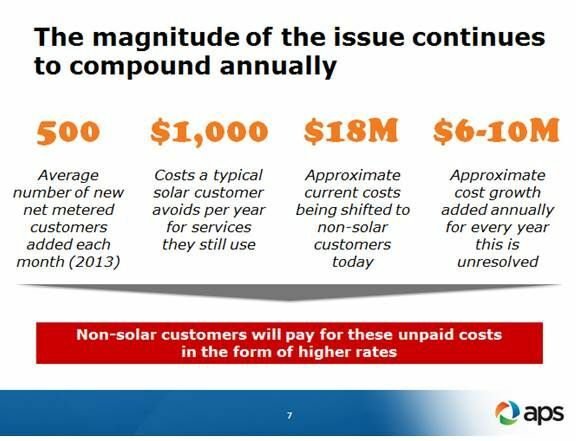 ”As the number of customers installing solar goes up, it drives rates even higher for non-solar customers, making the problem more difficult to solve,” the APS statement said. Net metering is a key component of the third-party ownership (TPO) business model with which Sunrun, SolarCity, Clean Power Finance, NRG Energy, Sungevity, SunEdison, and SunPower have led a boom in distributed solar growth in Arizona and other states over the last two years. The TPO companies argue net metering should be left in place because there are quantifiably more benefits than costs from adding net metered solar, including reduced stress on the transmission and distribution system and the creation of revenues and jobs in an industry that boomed in Arizona, even during the recession. “The proposal allows the ACC to create a backdoor tax on solar owners that will either severely curtail or kill solar in Arizona,” said Jason Rose, a spokesperson for the Barry Goldwater, Jr.-led Tell Utilities Solar Won’t Be Killed (TUSK) group. Procedurally, Rose explained, the next step is an open hearing before an Administrative Law Judge (ALJ). That hearing will include expert testimony on the costs and benefits of solar and of net metering. The ALJ’s decision will go to the ACC, which will make the final determination on whether to implement the APS proposal, leave net metering in place, or take another way.